Pre-owned, in LIKE NEW CONDITION, WITH ORIGINAL BOX & WARRANTY PAPERS, AND INSTRUCTIONAL BOOKLET. 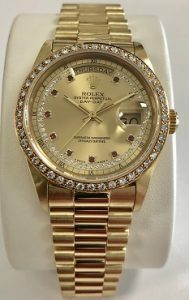 It is a gorgeous ALL ORIGINAL, President, Day and Date model, 18K, yellow gold, traditional 36mm case, with automatic movement. It features an all original diamond bezel, and beautiful, RARE String diamond dial, with 10 Ruby hour markers. It is available with the President hidden clasp. Retail New Approx $58,800. OUR PRICE $34,800 dlrs. EXCELLENT BUY! To purchase this watch CALL US 956.687.2981.